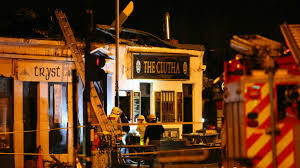 The news has been full of the terrible story of the police helicopter that crashed into the Clutha pub in Glasgow at the weekend. 9 people dead so far, as they still try to clear away the unstable remains of the old meeting place. One of the dead was a poet, John McGarrigle, who wrote of life in Glasgow with an honest voice- speaking of unemployment, drugs, human warmth and emotion in witty and funny ways. There seem to be a sad few of his poems on line, but there are a couple here. I did not know his work well, although had heard of him. Or a set of ill-fitting false teeth? This entry was posted in poetry and tagged clutha bar, glasgow, Helicopter, John McGarrigle, poetry by Chris Goan. Bookmark the permalink. Nice poem, a lovely tribute to dear John McGarrigle. I have read a few of his poems and they are impressive.